Sensor Sweep: Twilight Echoes, Fredric Brown, Shrunken Heads! So, let me drop this casually on you. I’m in a magazine with Robert E. Howard. You might respond with, “Robert E. Howard died quite a long time ago.” Yes. Yes, he did. But his stories live on. And one of his living stories has just been reprinted in Twilight Echoes #1, from Carnelian Press, edited by Steve Dilks. And it so happens that my own story, “A Whisper in Ashes” is also to be found in the same magazine. It makes me a little giddy. Fiction (Black Gate): The Best of Fredric Brown (1977) was the tenth installment in Lester Del Rey’s Classic Science Fiction Series. The then living horror author Robert Bloch (1917–1994) gives the introduction. H. R. Van Dongen (1920–2010) returns to do his second cover in the series, having done the cover for the seventh volume in honor of John W. Campbell. There is no afterword since, generally, the series seems to include an afterword by the author only if (fair enough) the author was living at the time. Since Fredric Brown had already died (1906–1972) by the time this book was published there is no afterword. I first heard of Fredric Brown a few years ago here at Black Gate. Our own esteemed editor John O’Neill was reminiscing about this very book. As with so many of John’s Del Rey “Best of” posts, I was intrigued and tracked down a copy. I read through the book and enjoyed many of the stories. Art (DMR Books): Edgar Rice Burroughs would turn one hundred and forty-three today. Since I have yet to pen “Part Two” of my centennial tribute to Roy G. Krenkel, I thought it apropos to at least look briefly at the treasure trove of ERBian art that flowed from RGK’s prolific pen and brush. As revealed in the excellent “RGK: Burroughs Artist” from 1964, Roy started reading ERB around the age of ten and always considered Burroughs his favorite author. Don Wollheim, after seeing RGK’s work in Amra, gave Krenkel a chance to fulfill a life-long dream: he offered Roy a contract do covers and illustrations for Ace’s new line of ERB paperbacks. RGK accepted immediately and got to work, with his first cover and illos being for The Moon Maid. From 1962 through 1964, Roy worked tirelessly, crafting one classic Burroughs cover after another, not just for Ace, but Canaveral Press as well. 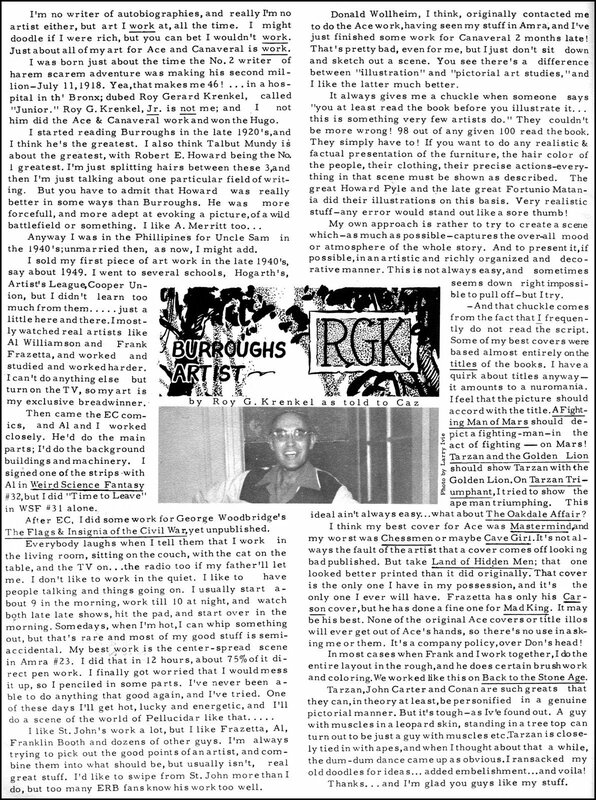 The “Burroughs Boom” that followed was powered to some extent by RGK’s action-packed, atmospheric art. Fiction (Mystery File): I’ve never been a big fan of Captain Hugh Drummond but he was one of the first characters in crime fiction to swim into my ken. Among the books on my father’s shelves was a hardcover reprint of the 1920 novel that introduced Captain Hugh, titled simply BULLDOG DRUMMOND, with stills from the 1929 talkie of the same name that starred Ronald Colman. Pulp Magazines (Pulp Flakes): National Dog Day. Fiction (Too Much Horror Fiction): Bigfoot was big news throughout the 1970s, thanks to that infamous Patterson footage of the late 1960s. Stomping across the pop cultural landscape and metal-and-asphalt playgrounds of the decade, he showed up on TV (“Bigfoot and Wildboy“! “In Search of…“! “The Six Million Dollar Man“!) and in some cheapie movies I recall older relatives and brothers of friends going to see. Even the commercials and specials on TV terrified me. Amongst the drugstore spinner racks that held our precious horror paperbacks readers could also find “non-fiction” on Sasquatch, and the covers offer that same fine vintage frisson. Men’s Magazines (Men’s Pulp Magazines): For a time, you could see them hanging in just about every hot rod or roadster that cruised the streets. Strung from rear-view mirrors, radio knobs or anything else that stuck out from the dashboard, they were a totem, a fetish, a collective counterculture howl of unconscious teenage angst. You’re probably thinking foam dice, right? Wrong. We’re talking shrunken heads, Daddy-O! Originally a war trophy and religious ornament of certain indigenous South American peoples, shrunken heads, or tsantsas as they are called in their native culture, they later became a curio, then a pop culture phenomenon to a generation of novelty-starved baby-boomers. Fiction (Ringer Files): It hasn’t seem like so long ago since my last post but, yeah, it’s been a while. I’ve been out in the world doing that full time gig of copying and pasting spreadsheets that they pay me to do, neglecting the stuff I love doing, like reading these terrific old books and sharing them with you. Last month I took a trip to Wisconsin and brought along a couple of short story collections by writers I really admire: John D. MacDonald and Harlan Ellison. Fiction (Pulp Archivist): The term atmosphere, in application to fiction, is often used in a somewhat vague or restricted sense. I believe that it can be most profitably defined as the collective impression created by the entire mass of descriptive, directly evocative details in any given story (what is sometimes known as “local color”) together with all that is adumbrated, suggested or connoted through or behind these details. It can be divided roughly into two elements: the kinetic and the potential; the former comprising all the effects of overt surface imagery, and the latter all the implications, hints, undertones, shadows, nuances, and the verbal associations, and various effects of rhythm, onomatopoeia and phonetic pattern which form a more consistent and essential feature of good prose-writing than is commonly realized. Fiction (Jeffro’s Space Gaming Blog): Pardon me for saying it, but… hey y’all, I told you so! You thought I was off my rocker. You thought I’d gone off the deep end. You thought I was unhinged. Mentally disturbed. Deranged even. Too bad for you, I wasn’t! So let’s talk about this. Why would it be fair to argue that Tolkien was in fact derivative? You’ve got to admit… there’s a lot more challenge to arguing that than the usual line you get about the sad, sad man that was heroically fighting a rearguard action to preserve all that was good and right and true as the captains of civilization’s remnants steeled themselves to commit to a truly titanic self-destruct sequence. Fiction (Barbarian Book Club): I decided to start the challenge by going back to the beginning of the 20th century by reading Lord Dunsany’s The Sword of Welleran. Edward Plunkett, 18th Baron of Dunsany, is considered by many the father of modern fantasy and credited as a major influence by Lovecraft, Tolkien, Howard, and even contemporary writers like Neil Gaiman. The Sword of Welleran is his most popular short story and hands down one of the best, if not the best fantasy short stories I have ever read. These past two weeks I went back and re-read it several times and even listened to an audio version. Lovecraft said that Dunsany was the greatest prose writer of the day, after reading this story I agree. Fiction (RMWC Reviews): Before Conan the Barbarian swaggered onto the stage, another Robert E. Howard character graced the pages of Weird Tales. Debuting in the August 1928 issue, Red Shadows introduced the world to the unflinching morality of Solomon Kane. Solomon Kane is a wanderer, a Puritan living in a dark 17th Century world full of evil monsters and worse men. Driven by a burning sense of purpose to punish evil, Kane comes across a young woman dying in the French wilderness. She names her killer, a bandit captain named Le Loup, and with a single sentence, Kane sets out to avenge this nameless woman’s death. Gaming (Table Top Gaming News): The new edition of Cosmic Encounters will soon be making its way to tabletops. Many of you have played the game, but many others haven’t, and can use this new version as a jumping-on point to try out a real classic of the board game genre. To help players get started quickly, they’ve posted up a nice quick-start rules guide (in comic form) for you. Gaming (Hack & Slash): There are like 12,000 terrible modules and adventures. This hobby is almost 50 years old at this point. There have been literally thousands and thousands of adventures written and are available. Why are we always playing the same ones? Why do people always fall back on Keep on the Borderlands, Forgotten City, Ghost towers, Horror Tombs, and Giants in their lairs, leading to drow? Cosmic Encounters rocks. It’s one of the few “Basic rules, then every team can break one in a different way” games that I’ve played that works. I’ve been longing for another shot at owning a copy, so that’s good news.